An ambitious new project for Tameside has been unveiled by Tameside College in partnership with Tameside Metropolitan Borough Council which will provide a massive boost the Ashton Town Centre economy, create new jobs and massively improved learning and skills facilities to invest in the future of young people right across the borough and Greater Manchester. This once in a lifetime opportunity for Tameside brings together the latest transport infrastructure, the fastest broadband connection in Greater Manchester and outstanding teaching and learning facilities in state of the art accommodation that doesn’t just transform the lives of young people but raises the aspirations and opportunities available to the whole Tameside community. At the heart of the multi million pound, four year ‘VisionTameside’ master plan is a transformational three phase development of the Tameside College Campus. The college plans to build three new Advanced Learning Centres, based in Ashton Town Centre and at the Beaufort Road site offering young people in Tameside ‘state of the art’ facilities that equip them for the challenges of a changing economy requiring a highly skilled workforce. The college is funding the majority of phase one through its own reserves with further support through grant funding from the Skills Funding Agency. Confirmation of the grant allocation is due in November 2013. In the first phase of the development, the College will build an Advanced Learning Centre on a section of the Camp Street car park in Ashton Town Centre which will maximise the benefits of the recently developed train, bus and tram transport hubs in the centre of Ashton. The Advanced Learning Centre will accommodate hundreds of students and staff and brings together three areas of study – A Levels, digital and creative skills and performing arts. The centre will house state of the art new facilities including laboratories, media suites and digital arts spaces for students preparing to take their place in the fast developing digital and technology economy. In addition to bright new learning spaces and student social space there will be a new 200 seat theatre, dance studios and workshop for students. The theatre will be able to accommodate touring and community theatre projects as well as student performances. 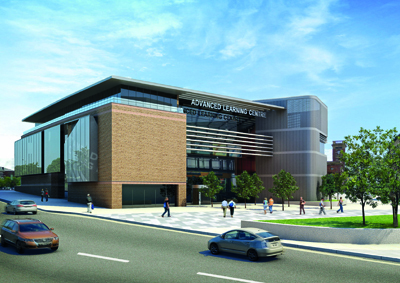 Also in phase one, Tameside College will have a second new building, the Advanced Technologies Centre, to be located at the existing college site on Stamford Street. The Advanced Technologies Centre is an iconic five storey building providing a cutting edge learning base to support the growth of advanced manufacturing in Tameside, supported by local employers and providing higher level skills to ensure Tameside retains its credentials as the manufacturing hub of Greater Manchester. Contractors are scheduled to start on site in the summer of 2014 for completion by September 2015. In phase two of VisionTameside a new 7,000 sq ft Advanced Skills Centre will be built, bringing thousands of staff and students into the town centre, boosting the retail economy, and providing the latest learning spaces for Tameside College students studying a wide range of vocational skills. At the same time and on the same site a new Joint Service Centre for Tameside Council and partners will be created which will be around half the size of the existing council offices, saving tax payers £1.5m per year from 2017 onwards. The current council building is only half occupied since the dramatic cuts to staffing that has taken place over the past 2 years. The new Joint Service Centre will provide more cost effective and customer friendly accommodation and better access to services for local residents. The new developments will be located on the site of the current Council administration building on Wellington Road and will be sensitively designed to sit alongside the prestigious Ashton Town Hall and old Water Board offices which are both listed buildings. Current plans anticipate that the phase 2 development will be completed by September 2017. Phase 3 will see Tameside College redevelop the Beaufort Road campus. Alongside the new Advanced Technologies Centre, students will have access to engineering workshops, construction and the built environment, sport and public services and health and social care provision. There will also continue to be provision for students with severe learning difficulties and/or disabilities and the central administrative services for Tameside College will continue to be based at the Beaufort Road campus. ‘Young people in Tameside deserve to learn in the very best of learning environments. We are making a commitment to ensure that every young person leaving school in Tameside gains access to the very best post 16 provision in outstanding facilities. Tameside College is in the top 3 Further Education Colleges in Greater Manchester and has success rates in the top 10 per cent of providers nationally. Councillor Kieran Quinn, Executive Leader of Tameside Council said “This programme will not only give a massive boost to the Ashton Town Centre economy by bringing in thousands of students and teaching staff, but it will also enable us to complete our plans to redevelop the Town Centre and Market Ground area and make it into a more modern, attractive and convenient place to visit and shop. Councillor Gerald Cooney, Executive Member for Learning, Skills and Economic Growth said “I am delighted by these plans. They build on the investment that the Council has already made, and is continuing to make in primary and secondary schools across Tameside. This year we have seen our young people achieve their best ever examination results. There is no doubt that this success was helped in part by the fantastic learning facilities that they enjoyed, and I am sure that as a result of the college investing in their new advanced learning centres we will see our young people go on to achieve even better Further and Higher education results. “The key to Tameside’s long-term future economic success is investing in its young people. We have to ensure that they have the rights opportunities, skills, aptitude and aspirations and I believe that VisionTameside will deliver for us on all these fronts. Regular updates on the progress of VisionTameside along with supporting imagery can be downloaded from www.visiontameside.com or follow us on Twitter @VisionTameside .